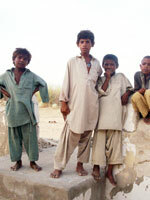 Orangi Town with an estimated population of 2.5 million is one of the biggest slums of Asia. A large number of this slum's inhabitants comprise of the Biharis who came to Pakistan after 1979, but now live there without National Identity Cards (NIC). Educational institutes have cropped up all over the city, claiming to cater to a variety of degrees, certificates and diplomas. While a large number of them are unregistered and therefore cannot be checked for quality, places such as the AIT which are registered and affiliated with reputable centres seem to fare no better. A couple of months ago, the residents of Essa Khaskheli Goth were expelled from their thatch houses that they had built on their lands, by an influential landlord, who is also a strong political figure. The reason for this expulsion was that the latter wanted to grab the land in question, which is said to be extremely valuable. Renowned scholar and psychologist, Dr Kamran Ahmed, says that music makes the human heart wakeful and forces one to dance or indicate other emotional signs. Perhaps due to this, reading or listening to the poetry of Sufi saints such as Baba Bulley Shah, Rehman Baba and Shah Abdul Latif Bhitai elicits the sound of Ghunghrus with each word and line. With the emergence of Bangladesh, hundred thousands of Biharis came to Pakistan in different phases of the 1970s and settled in Orangi town. From then on, many succeeded in getting an NIC, but still a large number of them were unable to get one; especially those who came after 1979. Pakistan Tehreek-e-Mehsureen-e-Mashriqi Mumtaz Chairman Husain Ansari, who also lives in Orangi Town, told Kolachi that hundreds thousands of Biharis' in the area lived uncertain lives because they did not have NICs. Countless opportunities are lost, especially on the economic front, when one fail to show an NIC, said Ansari, who himself runs a small toy making factory. He added that people from the area lack economic prosperity, because without a NIC, very few job opportunities were offered to them. Biharis' who came in 1974 under the repatriation agreement between India and Pakistan had fortunately received proper NICs, but those who came in irregular periods, between late 70s till late 80s were not given NICs, he added. "No employer would trust you even if you get employment in his factory or office, until you satisfy him with proper documents and especially show him a NIC card," said Muhammad Saleem, who runs a small in-house factory of sandals and slippers in Orangi town. Saleem thinks that people of his area have very limited prospects for acquiring good jobs. This is owing to numerous reasons, from less educational opportunities to under-privileged economic background. When these conditions were put forward to the town Nazim, Abdul Haq, he said: "We are aware of the various problems that people living in Orangi town have and we have been trying in our four year tenure to minimise the burning issues of this large part of Karachi." He accepted that the non-issuance of NICs to Beharis was a major problem in Orangi Town and that the provision of identity cards to all was a big challenge for the present government and also for future governments. "Considering the importance of this issue, we have opened a separate National Database and Registration Authority (NADRA) office in our town office," he said. The NADRA office was provided with state-of-the-art facilities to issue NICs to people in the area. "The NADRA office in our town has been issuing 200 to 300 daily but we know that a large number of people still require NICs," he said. He further said that although Orangi town had a population of approximately 2.5 million, the government insisted that it had 700,000 inhabitants. Considering the dwindling infrastructure and huge population of this town one can imagine the problems of this mini Karachi. "We have tried our best to overcome the problems in the last four years, but one should keep in mind that Orangi town is a Kachi Abadi with countless problems. It will take at least four more such tenures to overcome these problems," said Haq. Haq contended that when they came four years back, there was no road in the area which was in good condition. He said that they had to lay down everything from roads to a portable water line. "We have tried our best to provide at least basic facilities to the down trodden people of Orangi town." In a recent incident, several members of the faculty the AIT Department of Biomedical Engineering resigned in protest after being allegedly forced by the principal of the institute to aid students cheat in their exams. The resignations were tendered after the principal, Tayyab Shakeel, pressured them to provide illegal aid to first-year students of the Diploma of Associate Engineering (DAE) in Biomedical Engineering in their semester exams. "We were told in no uncertain terms that we had to help students cheat in their exams. We were given no choice but to obey these orders, and as teachers, we have resigned from the institute as we cannot stand by this practice," said Khurram Ali Nayyer, one of the teachers. Kolachi learnt that the head of the department, Sabeen Razi, had resigned as well, but she refused to comment on the issue. Who does the Institute cater to? The AIT provides classes for DAE in various fields of engineering. Most of the students at the institute belong to the lower-middle class or the lower class -- people who either cannot afford to pay for an engineering degree at a bigger university, or are too old to apply for Bachelors degree courses. Many of them are youngsters who did not gain enough marks in their Intermediate examinations for admissions to regular engineering degree courses. "A lot of these students went to government schools. Their educational foundations are already shaky. This course is the only chance that they have of setting things right to an extent. Without this diploma, they will have nothing at all for the job market," Nayyer told Kolachi. This is one of the reasons the teachers resigned when pressured into letting the students cheat. "It would be tantamount to taking our students for a ride, and ruining their future even more. No teacher can bear to do that," he said. "What is most unfortunate is that other heads of department were asked to advise us and make us understand the need to of help students cheat. Sometimes, when everyone is telling you to follow a particular path, you are compelled to question yourself. We asked ourselves whether we were maniacs for trying to stop cheating, but I am glad we made the right decision," another faculty member, who wished to not be named, said. "The matter is not how you are describing it. In fact, all these teachers got job offers from elsewhere and left. One of them went to Islamabad; another went to the UAE or Saudi Arabia; the third got married. Teachers keep changing, it is not a big deal," Principal Shakeel said. "Politicking" on campus is another issue that makes the lives of AIT teachers miserable. "Some students, who are also gun-toting political 'activists', barge into our rooms at will, and try to pressure us into accepting their demands. 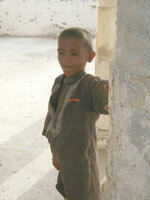 One cannot impart education under such circumstances," a teacher at the institute told Kolachi. The quality (or the lack thereof) of education at the AIT can be gauged from the fact that the placement of graduates is low. Even when they get jobs, they are hired as low-level technicians who barely earn Rs4,000 to Rs5,000 per month. Principal Shakeel, on the other hand, had a different point of view. "After completing the diploma from our institute, students apply to various reputed hospitals as technicians, and then work their way up. We cannot ascribe a particular figure to how successful our graduates are in terms of placement. There are other institutes in the city, NED for example, where the same diploma is granted. The market decides the success or failure of our graduates," he said. Others, however, were more idealistic. They demanded that the standard of education, particularly at government schools, be improved so that people like themselves aren't pushed to desperation to find a means of earning a living. 'If our basic educational foundations are weak, we cannot be expected to do any better in higher education either. We're here because we're desperate. We have families to support,' they maintained. The resignations of the teachers apparently did nothing except leave them jobless. "The entire exam paper was solved on the blackboard by the invigilators, and students were told to merely copy what had been written," one teacher said. On a positive note, however, some students, inspired by the ethical stance of their teachers, decided to walk out of the examination hall. "Not everyone can afford to do that, though. Economic compulsions don't go too well with idealism, especially in a country like Pakistan where citizens are not provided even what has been guaranteed to them in the Constitution," an AIT faculty member said on the condition on anonymity. The villagers, however, made history: they refused to bow down to pressure, and refused to be expelled unfairly from their decades-old houses. Instead, they chose to protest in a peaceful manner. They held demonstrations and organised hunger strikes, and even lost one of their senior leaders, Walidad Khaskheli, at a hunger-strike camp outside the Karachi Press Club. Walidad Khaskheli's death stirred people, and ultimately, the government was forced to pay attention to the plight of the poor villagers. Even then, it took four months for the government to finally give property right documents to the villagers, who are now jubilant over their "rare" success. Even though the provincial government has announced the regularisation of villages under its Goth Abad Scheme to give ownership rights to villagers and save them from threats of influential landlords, the project, however, has achieved little success to date, ostensibly due to bureaucratic snags and alleged corruption in the government departments. As a result, very few villagers have succeeded in getting legal papers for the land that they till. Activists in Sindh, however, believe that the four-month-long struggle of the brave villagers of Essa Khaskheli Goth against their expulsion has become a beacon of hope for other villagers and oppressed communities facing similar problems. "We are happy now, and are enjoying our freedom after finally receiving all the documents for our lands. The feudal lord has not come near us again, nor have his guards dared to bully us. We feel, however, that our struggle is not over yet. A lot more is left to be done," activists and villages from Essa Khaskheli Goth told Indus Watch. How did the Essa Khaskheli village struggle begin? The village is about 40 years old and is comprised of around 1,250 households. These villagers had moved to the present site for agriculture work, and built their homes on government land. The land in question actually belonged to the provincial irrigation department and the villagers had obtained a No-Objection Certificate (NOC) from the authorities concerned, indicating that the department had no objection to them living on that land. An influential landlord of the area, however, intended to encroach upon the 153 acres of fertile land where the village is actually located. He started harassing the villagers, in an attempt to intimidate and remove them. The villagers, however, refused to give in to the pressure tactics. Since they did not have the capacity to fight with influential landlords, they opted for a peaceful protest instead. Before setting up a protest camp outside the Karachi Press Club, the villagers had protested in small towns near the Goth. They realised, however, that this was not going to be very effective. Moreover, the feudal lord in question was using his political power to harass the campaigning villagers by kidnapping, torturing and abusing them. Many farmers were subjected to torture by the landowner's goons. This was when some activists who heard about the struggle advised the villagers to organise a hunger strike camp in Karachi to invite the attention of the authorities concerned. Even though the camp was backed by major civil society organisations, human rights groups and political campaigners, the credit, however, should go to the villagers themselves, who first decided to challenge the authority of a powerful feudal lord. For the first 20 days, their presence outside the Karachi Press Club had gone unnoticed by the media. Eventually, people started noticing the hunger strike camp, and the story was picked up by a number of major media outlets. The villagers told everyone that they were being deprived of their ancestral abodes by a certain influential landlord who, having political influence, had started claiming that he had the lease papers for the government land on which they were living. Luckily, the villagers had a lot of proof to contradict the Jagirdar's claim. They had brought with them every piece of evidence, including national identity cards (with address of the village), domicile certificates, the papers of a school in the name of the village, electricity and telephone bills, pictures of a mosque, a graveyard, etc which all inscribed with the name and address of their village, Essa Khaskheli. Initially, all these documentary evidences seemed meaningless to ascertain their claim because of the influence of the Jagirdar concerned. The persistence and patience of the villagers, however, eventually proved effective. Civil society organisations slowly started visiting their camp to express solidarity with them. Activists of the Pakistan Institute of Labour Education and Research (PILER) and other Joint Action Committee (JAC) members used to sit with them at the hunger camp. During this period, one of the senior leaders, Walidad Khaskheli, died at the camp. He had been receiving serious threats of dire consequences by the Jagirdar, and died of a heart attack. The villagers registered a case against the Jagirdar, and finally managed to stir the government. A number of provincial government ministers and advisors visited the hunger strike camp and accepted in writing the demands of the villagers. After Walidad Khaskheli's burial, the villagers returned to their hunger strike camp Karachi, and stayed there till the final acceptance of their demands to receive the documents for their land. The fruit of the long struggle was that the Jagirdar in question was forced to bow down before the "poor and powerless", and announced to withdraw his claims over the land of the village. Since this was an out-of- court settlement, many supporters of the campaign were not happy with the deal; they, however, were glad that the villagers had finally obtained rights to their land. The residents of Essa Khaskheli Goth now live in oeace, but millions of other villagers in Sindh are still living under the same circumstances, without any documents for the land that they have tilled for generations. Even though the Pakistan People's Party (PPP)-led government in Sindh claims to have taken the issue of village regularisation and providing free shelters to the poor seriously, the situation on ground contradicts all of this. Village chieftains still run their tribal and feudal courts and the oppressed people have to face harsh rulings of Jirgas (feudal courts) -- a situation that many don't dare challenge. Advocacy groups still believe that it is more important to regularise all villages of Sindh instead of just announcing schemes and projects. In many cases, villages in Sindh have been established on government land but the politically-influential landlords are getting leases for them through unfair means, forcing villagers into homelessness. All of this together has made poor villagers, mostly farmers and low-income earners, more vulnerable to all kinds of exploitation. Activists observe that village chieftains treat their farmers like slaves, even going as far as to deprive them of their share of crops. It is indeed a pity that while the government can lease millions of acres to multinational companies (MNCs) in the name of corporate farming, it continues to deny a basic right of the citizens, as enshrined in Article 38 of the Constitution of Pakistan. The Khaskheli villagers say that the four-month-long struggle initiated by them, as well as the outcome, was a sign of victory not only for their village but for all oppressed communities of Sindh. The struggle of these Haaris (peasants) will be a source of inspiration for other people in future. Some activists link the issue of depriving villagers of lease documents of their ancestral abodes with the impacts of climate change, food security and mass unemployment. According to them, after a few years, villagers might not be able to pay government fees and bribes to get the documents for the land that they have inherited, because the pressure of price hikes and depleting sources of income will create increased hunger and starvation. They advise the government to make the system of land regularisation transparent and poor-friendly so that it can be assured that everybody has access to certain offices to resolve their problems without facing any trouble and delays. Failure to ensure this, activists maintain, will result in continued insecurity for the farmers of Sindh -- the people responsible for producing our food. When Sufis and saints of yore desired a glimpse of Yaar (the Beloved), they began dancing. This love for music is also reflected in the style of their poetry and verses. Shah Abdul Latif Bhitai not only composed poetry but was also a great musician. 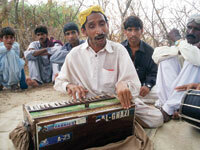 He invented the musical instrument called Tamburoo, while focusing on Deedar-e-Yaar (glimpse of the Beloved). It is said that once Bulley Shah was dancing, when a followers reminded him time of prayers. Bulley Shah did not pay attention to the man, and continued dancing. On being reminded again, Bulley Shah replied: "I am praying. People pray five times a day, but I pray every moment of my life." Bulley Shah and other Sufi saints like him did not care about the religion or race of their followers, and were revered equally by Muslims, Hindhus, Samis, and Yougis. In the ancient folklore of Heer - Ranjha, the latter is said to be a Muslim, who regularly visited Tilla Jogyaan, the Aastan (residence) of Guru Gorakh Nath, and to beg for his blessings. The Jogi warns him about the difficult path and hardships that lie ahead, but Ranjha remains steadfast and does not leave his doorstep until he obtains the ring of the Gorkhnathi Jogis. No one objected to the fact that Ranjha, a Muslim, had accepted the blessings of Jogis, and the story of Heer and Ranjha is still lovingly relayed throughout the province. In Shah Latif's peotry, Suhani was a married woman who crosses river to meet her paramour, Mehaar. Shah Latif does not object to Suhani's step or judge her. Instead, he prays to God that may to grant Suhani success in crossing the river and reaching Mehaar. Unfortunately, the pot which Suhani used to cross the river was made of raw mud, and broke. Suhani drowned and died, following which, Mehaar also killed himself. Shah Latif's poetry contains a chapter called "Sur Suhani" in which Suhani is portrayed as a brave and steadfast woman. The music of Sur Suhani touches the bottom of one's heart. Shah Latif also condemns those who spread differences between human beings. He says in Sur Yeman Kelyan: "I am Aalim (acholar) and I can know human beings. Those who create differences on the basis of religion, colour or caste know not their Selves. They know not who they are." The Sufis and their followers have always taken music, poetry and theater as the source of spreading the message of peace, love and equality. The enemies of peace, however, have always tried to create differences on the basis of religion, caste, and race. In our society today, certain politicians, fake religious leaders, and tribal Sardars have left no stone unturned to spread such differences. So bad is the situation, that the shrines of saints such as Rehman Baba, who dedicated their lives to spreading the message of love and peace to human being, are bombed and destroyed by extremists. While the shrines of Sufi saints are being demolished by extremists, all, however, is not gloom and doom. Devotees of the Sufis have established small academies to teach art and music to their descendents, and organise small events to promote the culture that has been handed down to them. 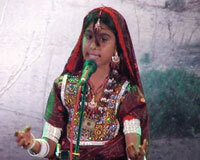 One such event was the recent Manganhar Music Festival, which was organised at the Arts Council Karachi. This festival is an annual occurrence to encourage children and young adults who are learning art of music at Bethaks (Schools), and help them promote the Sufis' message of peace, love and brotherhood. -- The writer is the Hyderabad coordinator for Mehrgarh.